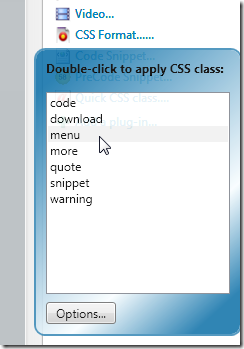 This is a very simple plug-in that stores one (1) single CSS class name, and applies it to the selected text with a single click. 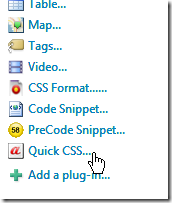 This is a fastest possible way to format several junks of your post with the same CSS class. The simple assignment comes has a price, however: It takes some more work to reconfigure the used CSS class. Therefore, it mainly makes sense if you have quite a lot of similar content to format at once. Otherwise, the second plug-in is probably the better choice. 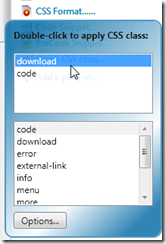 All you have to do is selecting the portion of text you’d like to format, and click on the plug-in. 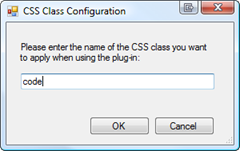 The configured CSS class name will be immediately applied to the selected text. Subsequent clicks on the plug-in directly apply the class name you configured – this dialog is only opened automatically the first time. This is a more flexible plug-in. 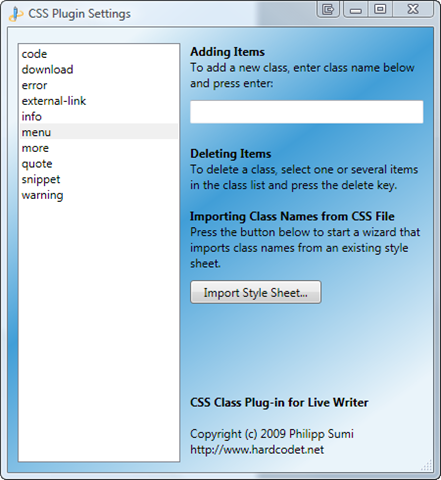 It takes two clicks to format your text with a given CSS class, but it maintains a configurable list of CSS class names, and allows you to quickly select the class name to be applied from a popup. Note that if you have configured 10 or more CSS class names, the popup will display two lists, of which the upper list contains the 5 most recently used class names. Clicking the Import Style Sheet button opens a file dialog that allows you to select a style sheet (probably the one you’re also using on your blog). 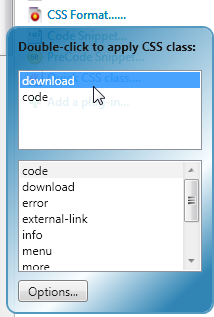 Once selected, the plug-in imports all new class names from the style sheet. Instead, Live Writer just keeps the old span, and wraps it into a second one. This is a great plugin and I am so appreciative of you making this available. One question, though, when I insert a class, it essentially inserts a “” tag for the class. Is there a way to have it simply insert the class into the style that is already present? Either way, thanks for developing this plugin — a super help for me. Unfortunately not – the possibilities the plug-in API delivers are terribly limited. I can’t even replace an existing CSS class through the API. Hope this will get better with a later version of Live Writer, but for now, that’s all I can offer I’m afraid. 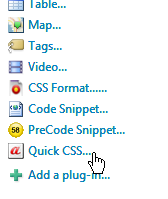 Is it possible to use plugin2 to have multiple css definitions? I have several different blogs with different style sheets – so it would be nice that when I’m working on one blog it’s styles are available but not when working on a different blog, for example. No, the plug-in does not know the notion of individual style sheets – internally, it just maintains a simple list of CSS class names. You can of course import multiple style sheets, but will end up with a merged list of classes. Any plans to do something like that? Or is there a simple way to purge the imported style sheet? No, this is currently not a priority for me – I’m busy with some other projects. However: Note that for the plug-in itself, there’s no notion of a Stylesheet (or the style sheet’s formatting instructions). 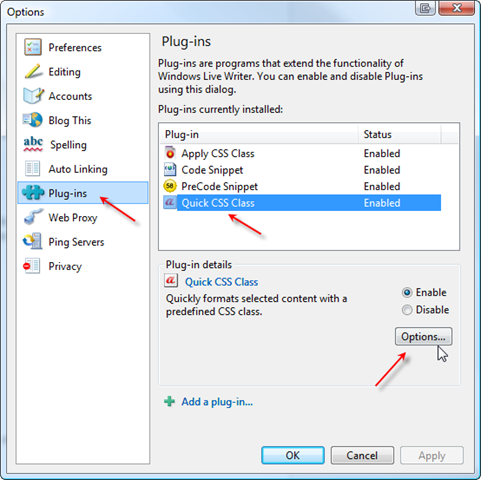 The plug-in only only maintains class *names*. After an import, the class names of the stylesheet have just been added to the internal list of classes and the plug-in does not know or care where the class names came from. 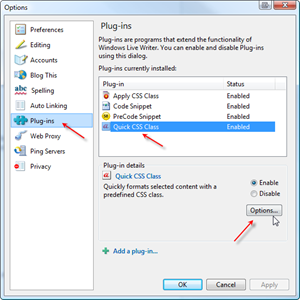 This means, that if you have similar stylesheets (same class names) on your blogs, your list of classes in the plug-in will work just fine for both blogs no matter which of the stylesheets you imported. Jason, this is amazing, just what I was looking for. Thanks for developing! Ps: How does anyone in the world run a blog without WLW? It makes me heart Microsoft more than I ever thought possible. Thank you so much for these great tips! I have been trying to get my residential window installations company blog up and running and I believe that these tips will really help me out! Thanks again!